Anyone who owns an ice cream maker will know that this is not a complicated process. We’re no longer required to fetch snow down from the mountains or patiently shave away at blocks of ice as our ancestors once did. The ability to make a basic custard is useful, but not an absolute necessity – as shown by the simple ‘Philadelphia-style’ recipe below – and then it’s just a question of mixing and matching flavours to your taste. Nonetheless, there is still something very magical about ice cream, the way it undergoes a texture transformation as it freezes, turning a nondescript liquid into a cool, creamy, velvety delight which melts in your mouth. This summer I’ve been eating a lot of ice cream. I got a machine for my birthday back in July, and since then have been experimenting with different flavours, pouring over recipe books and trawling the internet, discovering new techniques, ingredients and flavour combinations to experiment with. So when Kavita of the wonderful Kavey Eats blog asked if I’d like to get involved in her Ice Cream Wednesday series, I jumped at the chance. With recipes from Signe Johansen, Jean-Christophe Novelli and a whole host of ice cream obsessed bloggers, Ice Cream Wednesday has been an inspiring, indulgent and unmissable celebration of all things frozen and delicious. The recipe I came up with is something I’d been thinking about for a while. Making butterscotch pecan tartufi introduced me to the joys of ice cream cloaked in chocolate, and I started wondering if some sort of ice cream bar might be possible. As an even littler loaf, Feasts were one of my favourite ice creams, so I embarked on my first attempt to recreate this chocolatey childhood treat using a set of plastic ice lolly moulds. The result was a complete disaster, with half melted ice cream pouring all over my kitchen work surfaces, but it spurred me on to develop a simpler method, involving less margin for error and stronger, punchier flavours. 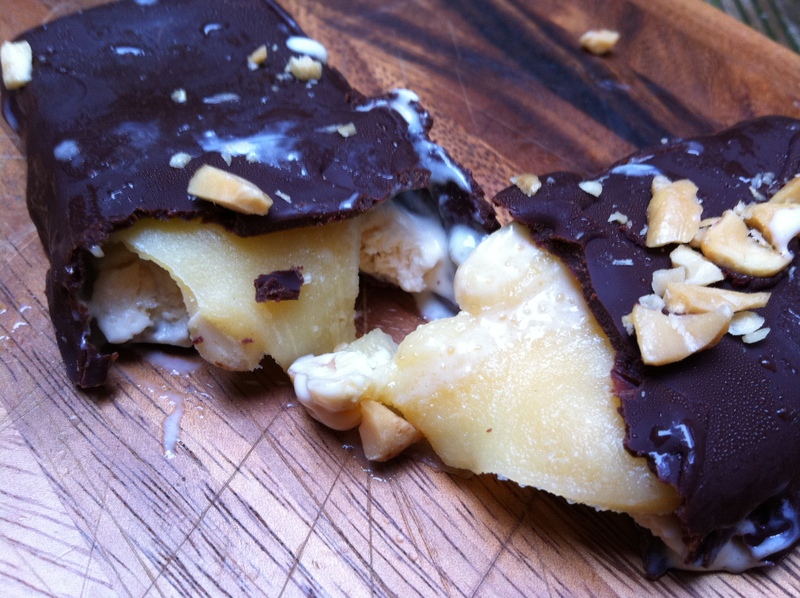 The result is my pimped up salty Snickers ice cream bars. Silky smooth peanut butter ice cream is topped with a layer of chewy caramel, scattered with slightly salted peanuts then cloaked in a rich robe of glossy dark chocolate. The salty sweet flavours and quality ingredients elevate this ice cream from a childhood snack to something altogether more sophisticated, and the look on people’s faces when you produce them from the freezer makes the small amount of effort that goes in to making them absolutely worth it. I’d still like to make an elegant, lolly shaped ice cream at some point – these bars are utterly delicious but a little rough and ready round the edges. If anyone can tell me how to do this, or where I can buy some suitable moulds, I’d love to hear from you. Otherwise do let me know what your favourite childhood ice cream or treat was. Who knows, it might be fun to have a go at recreating that too . . .
Purée the peanut butter, sugar, cream, salt and vanilla extract in a blender until smooth. Chill the mixture thoroughly in the fridge, then churn in your ice cream maker according to manufacturer’s instructions. Once almost set, spoon into the prepared tin, smooth the top flat and freeze until hard. Beat the mixture well until the butter is thoroughly incorporated. Bring it to a slow simmer then, keeping the temperature even, cook for 10 minutes, stirring continuously, until thickened and light golden-brown in colour (this mixture can burn very easily, so keep stirring and don’t leave the pan unattended). Once you have a thick caramel, remove from the heat and allow to cool slightly, then remove the ice cream from the freezer and pour a layer of caramel over. Sprinkle with the fleur de sel and chopped peanuts, then return to the freezer to set hard. Remove the frozen ice cream and caramel from the freezer. Pop the bottom from the loose bottomed tin – you should have a big square of frozen ice cream topped with a layer of hardened caramel. Slice this block into bars – I made 14 large bars, but you can adjust to your taste (and appetite!). Remove your prepared, lined board from the freezer at this stage. Now you need to work quickly. Taking two spoons, drop one of the bars into the chocolate mixture. Turn quickly to coat evenly in a thin layer of chocolate, then transfer onto the prepared board and sprinkle with chopped nuts (optional). Repeat for the remaining bars, returning to the freezer in batches if necessary (i.e. if they start to melt). Allow to firm up fully in the freezer, removing around 10 minutes before you want to eat them so the ice cream softens and the caramel becomes gooey. Keep any remaining ice creams in an air tight container in the freezer – the perfect indulgent dessert to have on call whenever you need a sugary fix. Wow, these look amazing! Love the combination of flavours and the salty/sweet combo. I too was a feast fan (do you remember when they briefly did caramel feasts?!) but there’s a soft spot in my heart for a fab ice lolly too! London Bakes – thanks 🙂 I don’t think I ever had a caramel feast…but I want one now! 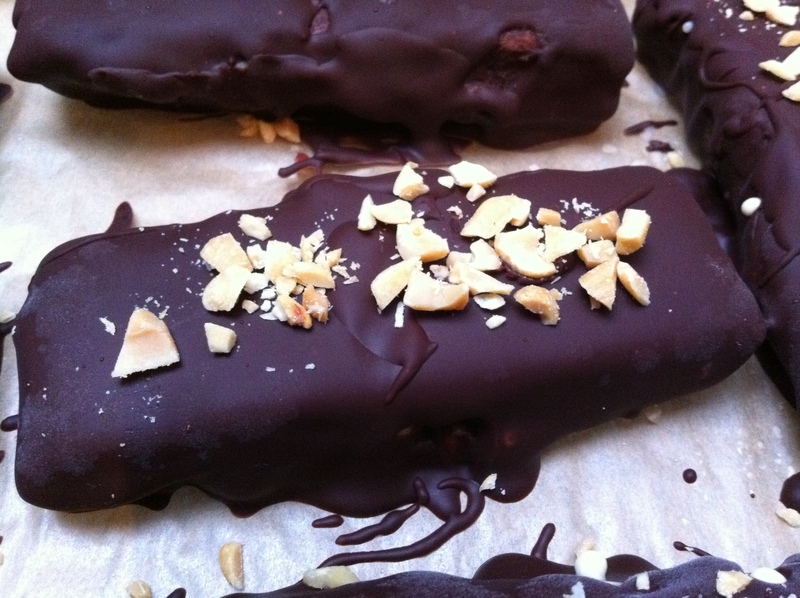 The Food I Eat – thank you – do try them, everyone should have a homemade salty snickers bar in their life! The Caked Crusader – thanks! I tried to keep the chocolate fairly thin, but actually it’s not a delicate dessert so no need to! Could you possibly devise a recipe for chocolate covered cannelloni stuffed with chestnut ice cream? I am a tame wild boar living in benign captivity in Tuscany, and my favourite foods are pasta and chocolate. My wild boary nature means I am also partial to chestnuts (eating not horse of course), but my captors/friends/benefactors have taken it into their heads to deprive me of the chocolate and pasta (something about going on a diet). Aiuto! Wow get you!! Some post. I made quince membrillo yesterday, total labour of love but made me so happy, guess this recipe is a bit like that. Do you have the recipe for the philadelphia ice cream? Those look might impressive and I have no doubt you would not be able to buy anything an eight as good anywhere. Feast used to be my favourite childhood ice, I’d completely forgotten, until you reminded me. Have no idea if they still make them. Think I’d prefer you’re sophisticated marathon bar now. Mmm, these are some very impressive looking ice cream bars. You are one very talented lady! Oh my goodness! The sweet and salty of these sound so delicious. I saw a recipe for homemade snickers bars in bon appetit a couple months ago and they looked fantastic, but dare I say these look even better? And you’re right… the oohing and ahhing that people make when you give them something made from scratch (even if it’s something deceptively simple like bread or ice cream) really is the best. I can’t believe you made snickers more interesting. oh my gosh! this looks so great!! Wow, these look great!!! I first thought they were real snickers bars 😀 Yum!!! 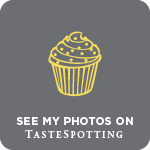 Choclogblog – love how everyone is rediscovering their childhood love of Feasts through this post! Jereme’s Kitchen – me too! I’ve run out now…need to make another batch soon. The Moveable Feasts – ooh thanks for the tip off, will have to have a look for the bon appetit recipe and see how it compares. What Katie’s Baking – thanks! Oh my!! These look unbelievably delicious. I want to stick my hand through the computer screen and grab one right now! I miss my ice cream maker so much (it’s in storage in New York for another year or two…) but I will bookmark this for when I have it back again. So impressive! 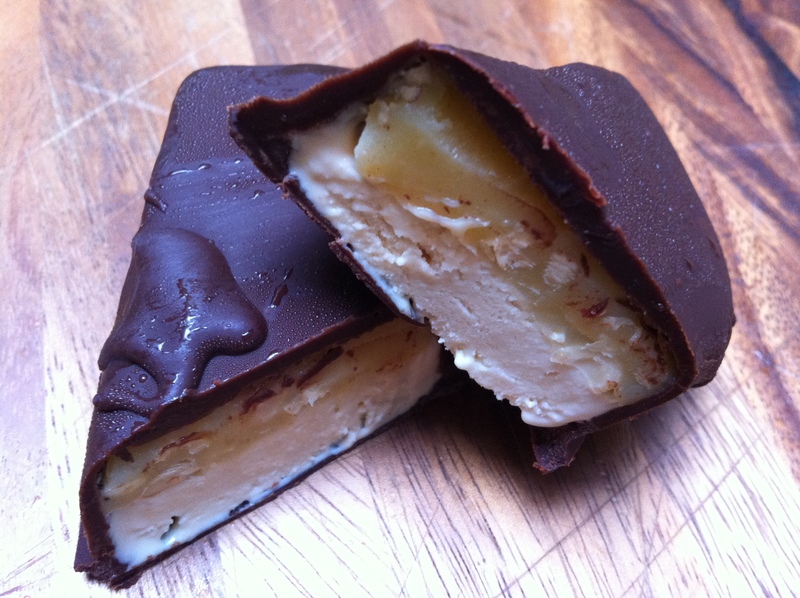 I love finding recipes for homemade candy bars, especially involving ice cream! Wow, I have to admit, I am impressed. I know the snickers ice cream you can buy. But so far I did not have the idea of making it by myself. This looks so delicious. Katherine Martinelli – someone needs to invent that feature on a computer – I want to do it all the time! Foodwise – thanks! They may not be perfect looking, but the taste more than makes up for it. Lemon Tarte in Paris – thank you 🙂 do give the recipe a go…so much better than shop bought! The Baking Fairy – they were SO much fun to make…will definitely be doing it again soon. Finally catching up on my RSS feed and wanted to thank you AGAIN for your wonderful guest post. What a FANTASTIC way to finish Ice Cream Wednesday (though I’m determined we bring it back next year). those look seriously impressive! not having an ice cream maker or a freezer bigger than a VCR, these are off-limits for me to make for the time being. instead, i shall just have to paw at my computer screen and imagine the deliciousness.